Not that I had any issues with it—quite the opposite, it was totally problem-free during the whole time. But I didn't want to wait for issues to arise. And, of course, one wants something new once in a while. So I became an owner of Toyota Prius PHV, third generation, model ZVW35, which was introduced back in 2012. My car was manufactured in September 2014, meaning it's just turned three. Why do I always choose a Toyota Prius? Firstly, statistically Toyota makes most reliable cars. Secondly, they provide the best price-to-quality and price-to-functionality ratios in my opinion. Thirdly, I simply like them as I'm very used to its knobs and buttons. And last but not least, they are environment friendly and efficient. And I know here what I'm talking about because I've driven quite a few rental cars, such as Ford, Citroën, Volkswagen and so on. During the test drive I've noticed how much had been changed as compared to the 2009 version! Let me highlight the most interesting things—and there's quite a bit, as its first owner was apparently very fond of options. And I'll start off with its most intriguing feature, the hybrid engine. The PHV in the model's name stands for plug-in hybrid vehicle, meaning a hybrid car that can be recharged by plugging it into an electric outlet. And hybrid means that the car is driven by the combined power of a petrol engine and an electric motor. "Regular" hybrid cars usually recharge their batteries automatically when braking or driven by the combustion engine, and the electric motor assists the engine when accelerating. My old, previous generation Prius, had a small nickel-metal hydride battery, and could only drive 1.5 to 3 km in the EV (electric vehicle) mode. A plug-in hybrid's battery can be recharged from a regular mains outlet. My Prius has a lithium-ion battery with the capacity of 4.4 kW⋅h. Of course it's very little in comparison to, say, Tesla Model S with its huge battery of 70-90 kW⋅h. 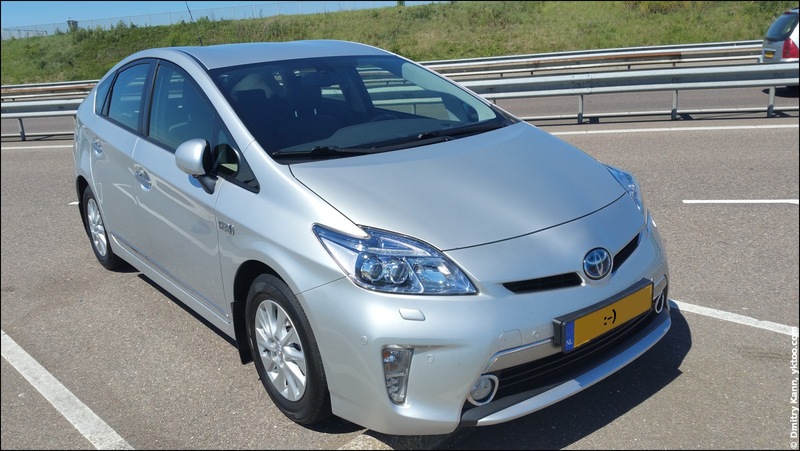 A fully charged Prius PHV has the range of about 18-20 km in the fully electric mode. On the one hand it isn't much. On the other, it's enough to buy your groceries or go for shopping to a nearby town. The EV mode can be turned on and of with a special button. However, if the battery is depleted or the gas pedal is pushed sharply, the EV mode will be cancelled. It also gets suspended as soon as the car reaches the speed of 90 km/h. 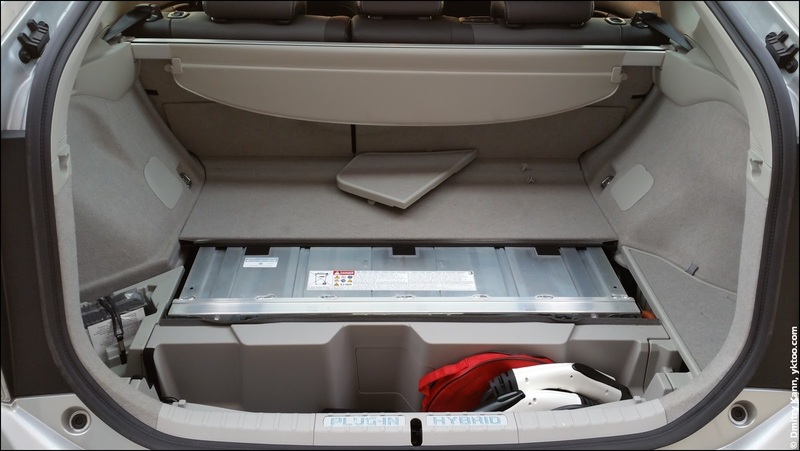 Toyota has decided to stash this larger battery in the boot, and that left no room for the spare wheel. I can only hope I won't need it. The boot of Prius PHV. It takes about an hour to fully charge an "empty" battery (with the current of 10 A, that is with the power of 2.3 kW), which means that an "empty" battery still has some 50% remaining charge. Hence a full charge will cost you circa 25 eurocents at our local tariffs (standard €0.11, off-peak 0.09). Which is almost for free in my view. Driving with petrol is about six times more expensive (and that, mind you, with the hybrid car, which takes only 3-4 litres gasoline for 100 km). Nowadays one litre gasoline costs here about €1.50. You can also program Prius to charge at night, with the off-peak rate. Priuses are known for their poor rear view, and one has to take that into account while driving backwards. The rear camera, which is activated automatically as soon as you set the gear to reverse, alleviates this problem and makes backward driving really easy. The first owner has additionally equipped the car with front and rear parking sensors (no idea why). Likewise, the rear ones get activated whenever you shift the gear into reverse, and the front ones are operated with a special button, so that you can disable them while stopping at traffic lights, for example. This way you can see your current speed without having to divert your attention from the road. The HUD's position and brightness can be adjusted, and it's well visible under any conditions while staying completely transparent for the driver. The cruise control function that maintains the set speed has been available in Priuses for years. The third generation has been upgraded with a radar, which allows for also maintaining distance with the car in front of yours. The minimum distance is selected with a steering wheel button (one to three notches) and is also influenced by your current speed and the speed of the car before you. So, for instance, if you're going at 100 km/h and the other car at 90 km/h, your Prius will decelerate some fifty metres before it (with the minimal distance of one notch). Whereas, if the car in front of you is driving faster than you, your Prius won't brake even if the distance is ten metres. Overtaking with activated cruise control is no problem, the car will accelerate when the gas pedal is pushed and return to the set speed once it's released. When the brake pedal is depressed, the cruise control mode is cancelled immediately. It will also deactivate as soon as the car's speed drops below 40 km/h, so this function is mainly useful when driving on a motorway. Apart from the radar, the new model displays the set speed and allows to change it with the 5 km/h step (100, 105, 110 etc. ), which is very useful. When the radar is disabled, the speed change step is, like before, 1.6 km/h. I'm personally using cruise control almost constantly on a motorway: it saves me from keeping my foot on the accelerator pedal and I don't run the risk of speeding (which is punished here already at 4 km/h above the speed limit). The new option made this experience even more enjoyable, but one shouldn't blindly rely on it. The radar is performing pretty well—as far as I can tell—by recognising cars and motorbikes in the same lane, and it doesn't get "distracted" by other lanes even on curves. However it would allow my Prius come real close to the car before every now and then. It also tends to ignore cars cutting you off. And, obviously, it can only "see" a single car—as opposed to me. What's also good to know is that the manufacturer doesn't assume responsibility for any accidents resulting from using this function. So use it at your own risk. The same radar is also used by the PCS (Pre-Collision System), which is a system that gets activated when a collision is imminent. In such case PCS will tighten the front safety belts and apply assisted braking. The system can be disabled with a special button. It's also worth mentioning that the headrests of this Prius will slightly move forward during a rear collision to reduce the risk of damaging neck-bones. Just like the previous version, this model allows for locking and unlocking the doors and starting the car with the key resting in your pocket. The doors will unlock as soon as you touch a front door's handle, and they can be locked with a button on the handle. What's new is that the lock buttons are now touch-operated and therefore easier to control. The lock button on the rear door is still a push-button, but it was moved away from view. The key remote has got an additional A/C button that remotely starts the air conditioning system so that you can now heat or cool the car before leaving the house. A frequently asked question is: what will happen if someone touches the door handle while you're distracted or occupied with something else? Toyota guarantees that the system will ignore that if the key is two metres (or more) away from the handle. In fact, you need to be even closer—within one metre, in which case it's highly unlikely you won't notice that someone is trying to open your car's door. Another common question is what will happen should you leave your key inside the car. The answer is: you don't have to worry. Prius won't let you lock the doors as long as there's a key inside (even if you stand outside with another key). And should your electronic key malfunction, there's a conventional mechanical key inside it, which you can use to unlock the driver's door. In Prius 2009 you could only use Bluetooth to make phone calls or transfer your phone's contacts. This one also has profiles for playing audio and data exchange. Which means, you can finally play music from your phone via the car's audio system. The data profile is used for address search in the Internet. This model has also got the digital DAB+ radio as an addition to usual AM and FM channels, so I can listen to BBC at last! The sound quality in DAB+ is awesome, but the reception is not always flawless. The GPS navigation has been notably updated as compared to my old car, which missed all the updates over the last 8 years. This one is much more up-to-date, however I still run into some discrepancies every now and then. As improvements I can mention the speed limit display and "breadcrumbs," dots marking the route you've recently driven. My version is also equipped with TMC, which is a digital radio system that is constantly receiving traffic information such as jams and roadworks. The navigation unit can also take this data into account, but I tend to not use it because the routes it suggests are usually complete nonsense. 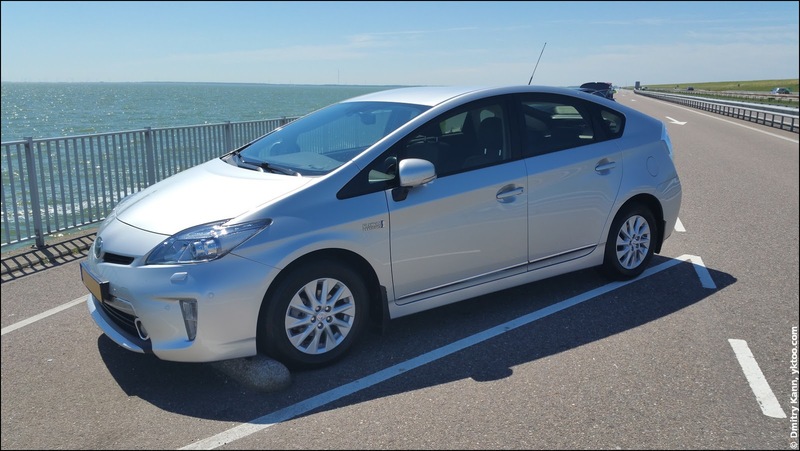 According to the user's manual, my Prius is equipped with an EDR (event data recorder), which collects and records diagnostic data such as the car speed, pedal positions, battery status, whether the safety belts were buckled etc. The vendor assures this data will only be used for crash investigation. 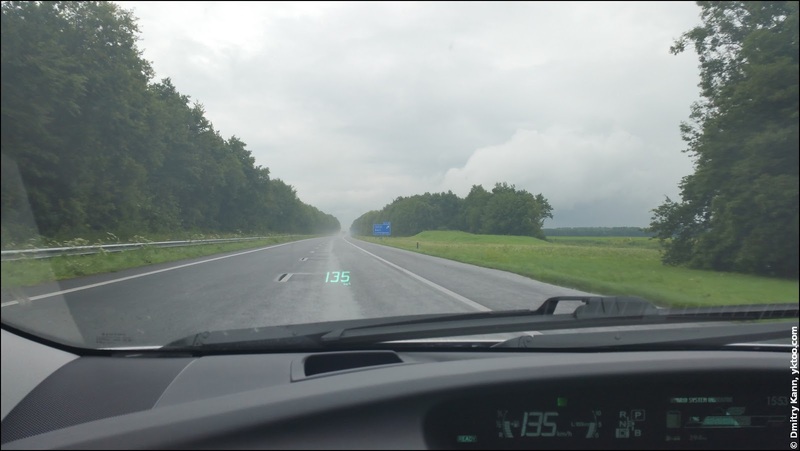 Rain sensor that activates the screen wipers and adjusts their frequency. Ambient light sensor that controls the lights. DRL (daytime running lights), small LED lights used when driving by day. Folding side mirrors. The mirrors fold automatically after the doors have been locked, and unfold as soon as you power the car on. 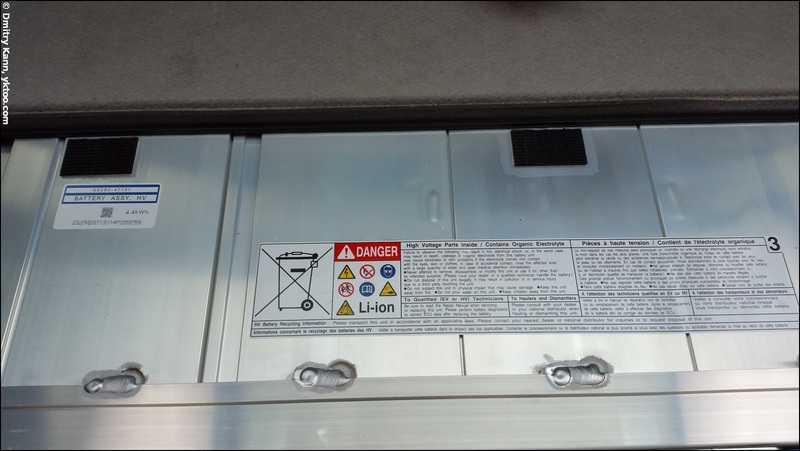 Fully automatic power windows with jam protection. Telescopic steering wheel. In the previous version you could height-adjust it, now you can also pull or push it. Knee airbag for the driver. Adjustable lumbar support for the driver's seat. Automatic headlight height adjustment based on the car's load. The previous version had a special knob for that. Auto power off after one hour. Automatic triple blinking of the turn signal when switching lanes, like in Volkswagen. Remote boot opening and closing, like in Volvo. A warning signal if not all windows are closed when locking the doors. Three months into driving the gadget I'm quite satisfied. All the systems are working perfectly, just like they are supposed to. The EV mode is something that impresses people the most: you push the button and start driving in complete silence. The fuel consumption—even without the EV mode—is pretty low, about 4 l/100 km at 100 km/h. My estimation is thanks to that the price difference with a regular car will pay off in three to four years.